This article is about elevated footbridges. For other uses, see Skyway (disambiguation). "Skywalk" and "Skybridge" redirect here. For other uses, see Skywalk (disambiguation) and Skybridge (disambiguation). 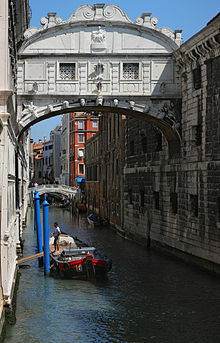 Bridge of Sighs in Venice, Italy. A three-storey bridge at The Core Shopping Centre in Calgary. A skyway, skybridge, or skywalk is a type of pedway consisting of an enclosed or covered footbridge between two or more buildings in an urban area. This protects pedestrians from the weather. 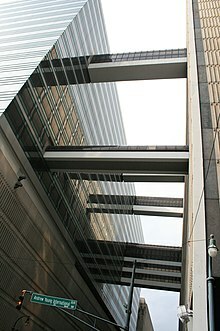 In North America skyways are usually owned by businesses, and are therefore not public spaces (compare with sidewalk). However, in Asia, such as Bangkok's and Hong Kong's skywalks, they are built and owned separately by the city government, connecting between privately run rail stations or other transport with their own footbridges, and run many kilometers. Skyways usually connect on the first few floors above the ground-level floor, though they are sometimes much higher, as in Petronas Towers. The space in the buildings connected by skyways is often devoted to retail business, so areas around the skyway may operate as a shopping mall. Non-commercial areas with closely associated buildings, such as university campuses, can often have skyways and/or tunnels connecting buildings. The world's largest discontinuous skyway network – Calgary, Canada's "+15 Walkway" system – has a total length of 18 km (11 mi). The Minneapolis Skyway System is the world's largest continuous system and spans 11 miles (18 km) connecting 80 blocks in downtown Minneapolis. On a smaller scale, terminals of large airports are often connected by skywalk systems, as at Manchester Airport, United Kingdom; in many airports, retractable jet bridges provide a direct connection between airplanes and terminals. Some cities have the equivalent of a skyway underground, and there are also mixed subway/skyway systems; see underground city. Besides pedestrian safety and convenience, the chief reasons assigned by urban planners for skywalk development are decrease of traffic congestion, reduction in vehicular air pollution and separation of people from vehicular noise. A number of cities (for example, Spokane, Washington) have given intricate analysis to skywalk systems employing computer models to optimize skywalk layout. There is debate about the negative impact on urban areas of skyways. Robertson (1988) noted the negative impacts to street activities, and reductions to the property value at ground level. Woo (2012) found that skywalk systems could be negatively associated with promoting consumerism. Cui (2015) called for more research into the impact of skyways in developing countries. There are significant skyway networks in many cities in the US Midwest, such as Minneapolis, Saint Paul, Des Moines, Cedar Rapids, Rochester, Cincinnati, and Duluth. Most networks in North America are privately owned. A notable exception in are the Saint Paul skyways, which are publicly owned. Highest cantilevered skybridge between buildings in the world now placed in local Raffles City skyscrapers complex in Chongqing, China. World longest 430-meters pedestrian hanging skywalk Zhangjiajie Glass Bridge between mountain peaks also situated in China. One of the most famous similar cantilevered skybridges known in Singapore's Marina Bay Sands resort complex of skyscrapers. Also wide known the world's highest 2-story skybridge, 170 m above the ground and 58 m long, between the two towers on 41st and 42nd floors in Petronas Twin Towers dual skyscrapers in Kuala Lumpur, Malaysia. Malaysia also have the mountainarian tourist pedestrian glass-bottom Langkawi Sky Bridge in Kedah, Langkawi. 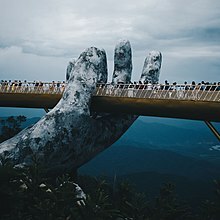 One of the most impessionable hanging pedestrian skybridges, supported by two giant hands, Golden Bridge now attracts the tourists in Ba Na Hills near Da Nang, Vietnam. In Bangkok, Thailand there are more than 5.4 km of covered wide dedicated elevated skywalks with lighting. These were developed due to lack of proper sidewalks as well as street hawkers and local merchants taking advantage of any sidewalk space as makeshift commercial real estate. Common reasons skywalks were built include to avoid street pollution, dust, wetness from food vendors and/or rain, potholes, long queues, crowds, and uneven pavement, supporting urbanism but probably most importantly, tourism receipts. Most skywalks connect to a BTS station and utilize space underneath the rail line and BTS pillar supports. These skywalks have connector ramps which connect stations to malls seamlessly and are paid for by the malls themselves, otherwise the city and BTS fund walkway development. A 50km long extension project was shelved in 2011 due to funding issues, nevertheless the system is growing organically. In Hong Kong, there are numerous foot bridge networks across the city. Particularly large networks exists around elevated or at grade MTR stations and connections between malls and housing estates in new town centers. The largest network spans Admiralty, Central and parts of Sheung Wan districts in the CBD and consists of the Central Elevated and Central–Mid-Levels Walkway systems which link up over 40 major office buildings. The Central–Mid-Levels walkway system is the longest outdoor covered escalator system in the world according to Guinness World Records. Other large systems exist in Tsuen Wan and Mong Kok. The Mumbai Skywalk Project is a planned discontinuous network of over 50 km of skywalks in Mumbai Metropolitan Region, India. The skyways will connect Mumbai Suburban Railway stations to important junctions, each 1 to 2 km in length. The first of these is a 1.3 km (0.8 mi) long skywalk connecting the suburban regions of Bandra and Kurla. Additionally, short skyways are used to connect buildings in other Asian locations. Brussels, Belgium has a skyway between the two Belgacom Towers. London has skywalks on the Barbican Estate and London Wall. The City of London Pedway Scheme was devised as part of the post World War II reconstruction plans for London, it was put into effect mainly from the mid-1950s to the mid-1960s and eventually abandoned by the 1980s. Mumbai Skywalk Project, Mumbai, India. A Brutalist skyway at the University of Leeds, England. An inside view of the skybridge of Petronas Towers. This skyway at London Gatwick Airport is designed to allow aircraft to pass under. Skyway at 6th Avenue at Pine St in Seattle. The skyway system in Taipei. Skybridge in Covent Garden, London. Wikimedia Commons has media related to Skyways. ^ Robertson, K. A. (1988-07-01). "PEDESTRIAN SKYWALK SYSTEMS: DOWNTOWN'S GREAT HOPE OR PATHWAYS TO RUIN?". Transportation Quarterly. 42 (3). ISSN 0278-9434. ^ Ares (2012-07-02). "Guest Article: Skywalks in Hong Kong and their Consequences on Urban Communities". Places. Retrieved 2016-11-05. ^ Cui, Jianqiang; Allan, Andrew; Lin, Dong (2015-06-03). "Assessing grade separation pedestrian systems: Planning, design and operation". URBAN DESIGN International. 20 (3): 241–252. doi:10.1057/udi.2015.8. ISSN 1357-5317. ^ Montgomery, Michael R.; Bean, Richard (1999-01-01). "Market Failure, Government Failure, and the Private Supply of Public Goods: The Case of Climate-Controlled Walkway Networks". Public Choice. 99 (3–4): 403–37. doi:10.1023/a:1018301628084. ISSN 0048-5829. ^ "How a small request kicked off a big debate over skyways and public safety in St. Paul". MinnPost. Retrieved 2016-11-05. 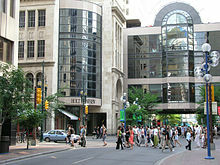 ^ "Calgary's +15 Skywalk". Archived from the original on 2013-09-21. ^ Skywalks – Greater Des Moines Convention and Visitors Bureau. Seedesmoines.com. Retrieved on 2011-09-30. ^ Skywalk, Skywalk Fitness Program, Clean & Safe Team Contact. downtownduluth.com. Retrieved on 2016-04-26. ^ "Connected Hotels in Indianapolis". Visit Indy. Retrieved 2017-10-30. ^ "BMA's skywalk project 'over-priced'". 2011-03-03. ^ Bellman, Eric. (2010-01-19) Packed Streets Have a City of Walkers Looking Skyward for Answers. Online.wsj.com. Retrieved on 2011-09-30.